Berkeley Earth have a new analysis of global daily temperature anomalies, which also shows a long term fall in diurnal temperature ranges. Daily temperature anomalies since 1880. Traditional BEST annual temperature anomalies are shown in blue. The black curves are 365 day averages of the daily anomalies and (Tmax-Tmin) anomalies. I found and plotted the data via Twitter thanks to Robert Rohde ! I will be talking about working with daily temperature data at #EGU2018 on Friday. Long answer: A baseline is estimated, though the process used to estimate specific days (e.g. June 13th) is somewhat more complicated than, for example, just averaging every June 13th from 1950 to 1980. I also plan to calculate global daily anomalies in the near future. This entry was posted in AGW, climate science and tagged global warming. Bookmark the permalink. Will be interested to see global daily anomalies. Speaking only for myself, of course, I find it more than a little troubling that the daily anomalies curve shows a minimum inflection in the 1980-1985 time frame. That is, the daily anomalies may also be starting to rise. Rising average temperatures due to an increase in nighttime temperature (daily Tmin) with no change in daytime temperature (daily Tmax) seems to me consistent with a CO2 IR absorption related warming effect. I gather from your post that the daily temperature anomaly, daily Tmax-Tmin, is just that. Consequently, if there was se of a minimum inflection point, and the change in the daily temperature anomaly has gone to zero or is turning positive, then it follows that either nighttime temperatures are rising at a higher rate (than before the inflection), or daytime temperatures have also begun to rise, or both. From my probably inadequately informed perspective, that suggests we may have entered a new phase in the warming process where either the greenhouse effect has pushed into the daytime hours as well, or has grown even more effective at night. Neither of those bodies well for use of historical data to either predict the short (or longer) term trajectory of global temperatures or forecast weather using models that involve assumptions regarding daily Tmax-Tmin relationships (or the short term atmospheric energy relationships they imply). 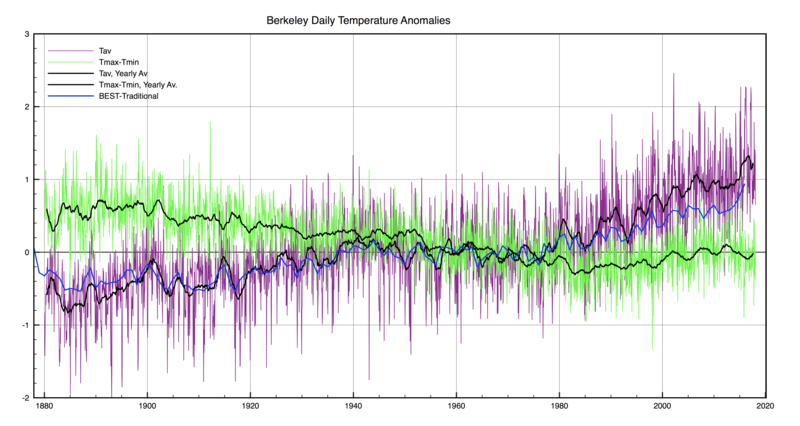 Berkeley use a normalisation period from 1951 to 1980. This explains why all the curves converge together on the zero line around 1970. However the (Tmax-Tmin) curve does indeed show that nighttime temperatures have risen faster than maximum daytime temperatures. The average though has also increase. The daily data appears to warm even faster than their monthly data. Berkeley use a spatial fitting procedure to extract their anomalies which is difficult to reproduce. Therefore I am currently trying to analyse the daily data from NCDC myself. There are ~ 3 billion measurements from some 106k stations dating back to 1760, so it is a tough task. I have an idea how to do it though which avoids discarding any data no matter how short timescale it lasts.